The end of weekend always leaves me pensive, the thought of waking up to another Monday begins to well up from Sunday evenings, precisely while enjoying a whirlwind weekend amid fun and merriment and now and then my mind wages in counting hours so as to remind myself of the time of revelry left. Mondays were always blue for me, from that very childhood, posing the beginning of yet another tumultuous week between schools, tuitions, studies and deadlines; after studies were over and a tryst with job came into picture, Mondays projected a dreadful threat of a long stretch of week with no respite from work in sight. Now that finally I am enjoying the sought-after break from work, I am at leisure to fathom the reason why blue is associated with Mondays. It's interesting to note that before the invention of washing machine, Mondays were kept aside for washing clothes manually with a blue dye to preserve color. Blue signifying depression corresponds well with the cheerlessness that Monday evokes to the atmosphere of a work place; hence Monday & blues perfectly juxtapose each other. 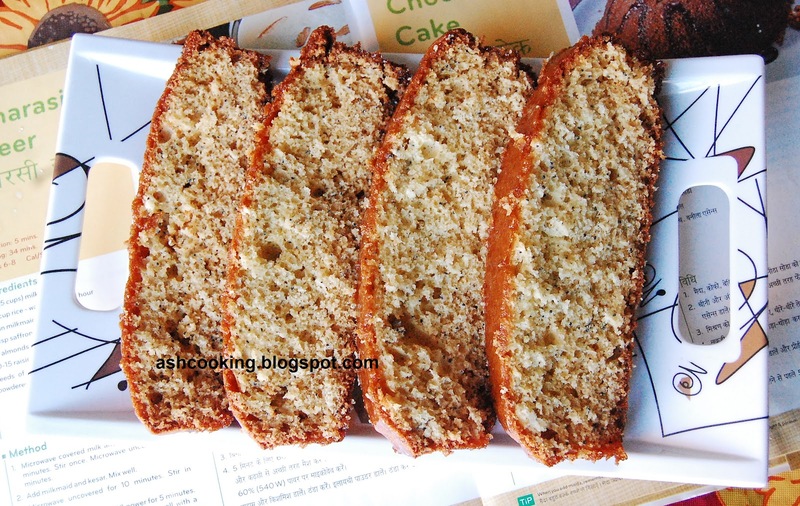 If you are regular in my blog, you might have noticed that most of my cake recipes are posted on Mondays which is because my hubby loves having a slice of cake at breakfast. 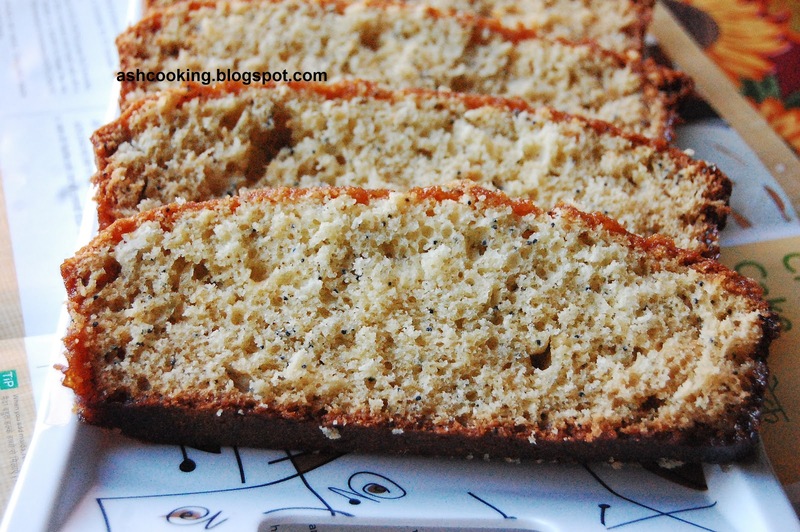 This week I wanted to try this wondrous recipe of Poppy seeds bread with Mango glaze. Actually, you may substitute mango juice used in the glaze with any other favourite juice of yours, guava, orange, and apple and so on and so forth, applying your creativity into work. 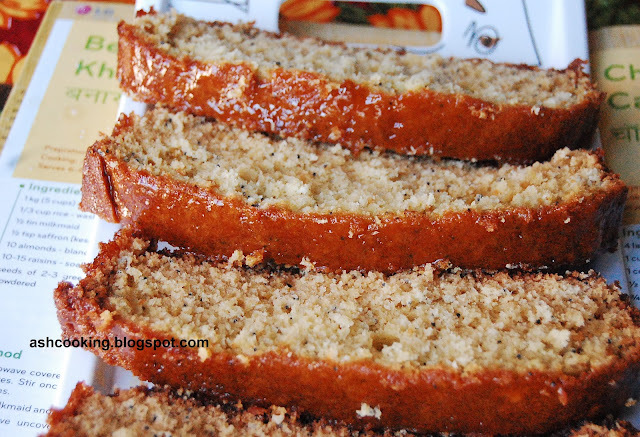 To keep the bread simple in texture, I didn't add walnuts or raisins or chips of any kind, but according to your taste, you may toss some into the bread you bake. 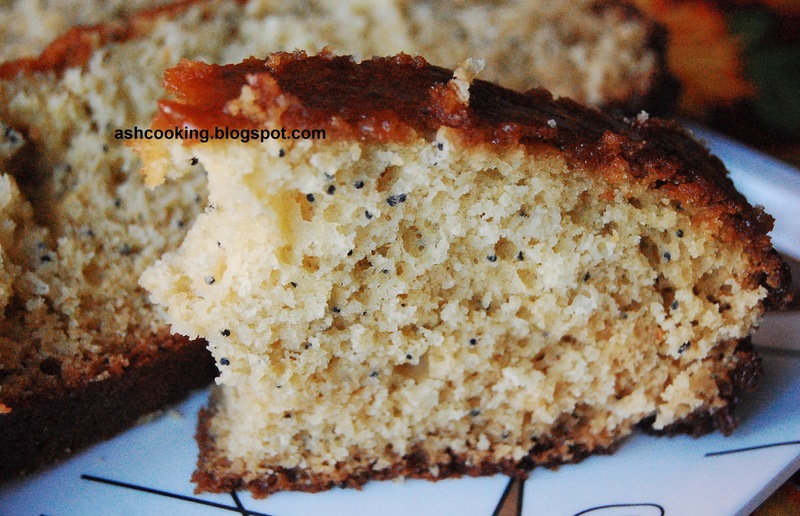 1) In a mixing bowl, combine flour, baking powder, baking soda and poppy seeds. 2) In another mixing bowl, using an electric beater beat eggs, milk, butter, sugar to a smooth mixture. Add vanilla extract and almond extract. Stir in to mix. 4) Preheat an oven to 350 F/180 C. Spread the prepared batter in a greased bread loaf pan smoothing the top with the back of a spatula. 5) Bake for 45-50 minutes till a toothpick inserted at the centre comes out clean. 6) For the glaze, combine the ingredients in a microwave safe bowl and heat it in the microwave for 5-8 minutes till sugar completely dissolves. Slowly pour this mixture on the cake spreading it evenly across the sides. 7) Let the glaze absorb into the cake before slicing and serving.